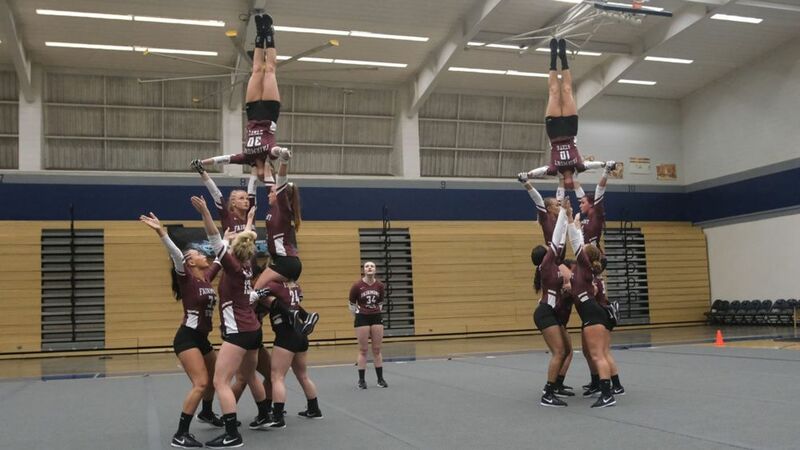 Coached by Bridgeport's Kristi Kiefer, the Fairmont State Acrobatics & Tumbling team turned in a strong performance in the tumbling and team event to pick up a come-from-behind victory over Hawaii Pacific (274.245-274.015) on Friday evening in Honolulu. Fairmont State's score of 274.245 was it's highest since the 2017 season, when the Falcons scored 278.350 in a narrow loss against Alderson Broaddus on senior day. The win helped Fairmont State improve to 3-1 on the year, while HPU remains winless at 0-3. With Hawaii leading 126.200-123.900 after four events, Fairmont State trimmed the lead by more then two points following its performance in the tumbling event, which the Falcons won 54.875-52.825. Fairmont State's individual tumbling passes anchored the event, as Karah Naples turned in a 9.650 in the aerial pass, followed by Catherine Reynolds turning in a 9.775 in the six-element pass, and Alexis Smith scoring a 9.60 in the open pass. Fairmont State completed the comeback with a 95.47 in team event, edging HPU's score of 94.99 in the event to take the win. Despite being outscored in the first four events of the meet, the Falcons still turned in an impress performance with eight scores of 9.50 or higher during the first four events. Fairmont State scored a 9.95 in the open pyramid, which marks the first time the heat did not score a 10.0 this season. The Falcons also scored a 9.90 in the compulsory toss, a 9.85 in the synch pyramid, and a 9.75 in the six-element acro. The Falcons now prepare for two home meets to close out the season, starting with a Mountain East Conference meet against Glenville State on Wednesday, March 20. The team consists of Madelyn Strait (Bridgeport High School graduate and bridgeport resident), Tamara Boles (Bridgeport resident), Caitlyn Faint, Karah Naples, Abby Moreland, Jennifer Tassos, Alexis Allen, Catherine Reynolds, Gabriella Lesko, Kelsey Kyle, Maddie Froman, Alexis Smith, Brionni Dowson, Ansley Froman, Priscilla Richmond, Kandyce Blocker, Phoebe Lewis, Sydney Moore, Madeline Rushing, Kerrigan Johnson, Gemma Cox, Haley Altizer, Alexa Johnson, Allison Butts, Ashley Rebel, Regan Teets, Abagail Settembrino, Mariah Ack and Erica White. Danielle Cutri and Ryan Demary are assistant coaches and Nicole Uccello is graduate assistant coach. Editor's Note: Pictured top is a stunt performed at the Honolulu competition. Also pictured from top are Head Coach Kristi Kiefer and members Madelyn Strait and Tamara Boles.